After 22 consecutive games beating every opponent that was put in front of them, Real Madrid have finally been stopped. 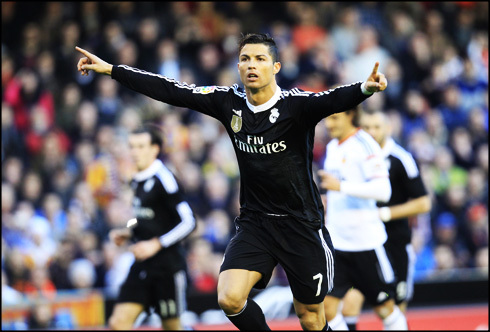 The Merengues were defeated 2-1 by Valencia this Sunday afternoon and not even Ronaldo's opening goal from the penalty spot helped his side rescuing any point from the Mestalla. Fresh off their 4-2 loss in the Milan friendly last week, Real Madrid never looked entirely comfortable against Nuno Espirito Santo's side. It didn't start all badly for Madrid though, as they initially took the lead in the 14th minute, through a penalty-kick taken by Cristiano Ronaldo after Alvaro Negredo handled the ball in the box. Ronaldo coolly slotted home for his 26th league goal this season and the Merengues were on the driving seat still before the first quarter of an hour had been played. However, that goal would not be enough to break a spirited Valencia side, who kept the pressure up making things increasingly difficult for Carlo Ancelotti's men. The teams would go into the half with Madrid leading by 1 goal, but few would have expected the score line to remain the same, and they were right. The second half brought on more Valencia dominance and more shaky play from Real Madrid. Early on, a strike from the impressive André Gomes right outside the box went just wide of Casillas' goal, with the veteran keeper clearly beaten. Soon after however, Valencia would be rewarded for their excellent play after some good build up work freed Antonio Barragan. His low shot was deflected off Pepe into the net past a helpless Casillas and Valencia were suddenly level. Still, they weren't done and merely 13 minutes later in the 65th minute of the game, Nicolas Otamendi rose majestically to head a corner into the roof of Real Madrid's net. 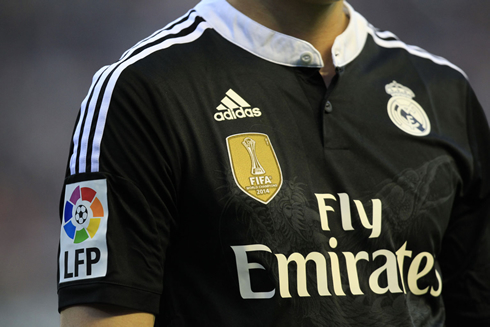 Suddenly, halfway through the second half Madrid were down 2-1 and in serious danger. The Merengues responded well and put Valencia under pressure numerous times. Gareth Bale likely had the best chance of the game after a quickly taken free kick, but he selfishly refused to pass to a waiting Benzema in the center of the box and the play ended up being wasted. The Welshman sprinted down the right wing in similar fashion to his goal against Barcelona in the Copa Del Rey final from last year, but this time around, he was unable to finish as Diego Alves closed down the angle and Otamendi intervened with a super sliding tackle. Real Madrid would keep the pressure up, but the Valencia defense would hold firm. Isco had two chances inside the box, one from a shot and another from a header at pointblank range, which would be well saved by Diego Alves. As the final whistle blew, a euphoric Valencia crowd celebrated and frustration settled in for Madrid. Barcelona will now have a chance to leapfrog the Merengues and go to the summit of La Liga if they can do the business against Real Sociedad later on. Still with a game in hand, Real Madrid should be able to retain their lead eventually. Things won't get easier however and up next for Real Madrid? A Copa del Rey clash with city rivals Atletico Madrid. 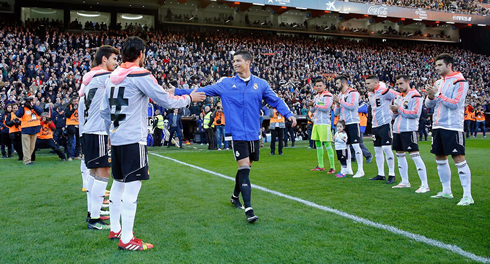 Cristiano Ronaldo next game will be an away Copa del Rey fixture against Atletico Madrid, on the 7th of January of 2015. You can watch Juventus live stream, Atletico Madrid vs Real Madrid, Sunderland vs Liverpool, Everton vs Manchester City, Chelsea vs Newcastle, and Crystal Palace vs Tottenham, all matches provided from our live football stream game pages.